Artisans in Miniature: Hello, The AIM Blog is back! Hello, The AIM Blog is back! After a long break, I am pleased to announce that the AIM Blog will once again be updated on a regular basis. 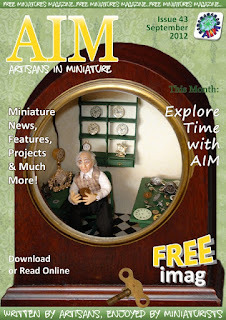 Here on the AIM blog, you will find all the latest news, highlights and gossip from the members of Artisans In Miniature and what a better time it couldn't be, with Halloween and Christmas just around the corner, prepare to be dazzled and delighted with highlights from our talented members. Whilst you wait for the blog posts to start, why not take a look at our latest AIM iMag. Available to download and read for free. So grab yourself a cup of something nice and click the link below to our little of miniatures. I am working on the next issue of the magazine right now!